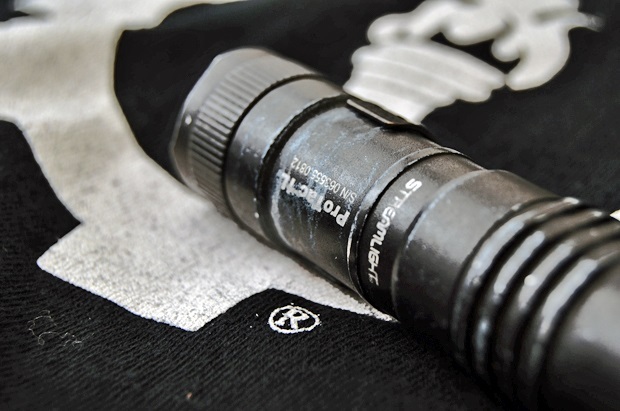 I am an unapologetic SureFireÂ loyalist when it comes to most of my flashlight needs.Â From 1999 to 2010, I owned nothing but Surefire products and when I was issued another brand light for my entry/patrol rifle during my time with the DOD, I said no thanks and stuck with my Surefire. That changed one day as I was standing in line at one of those sporting goods stores that doesn’t know if it wants to be a Cabela’s or the gear store from Commando (I might be dating myself with that one) and on the Impulse Buy rack was a small light the size of a roll of Lifesavers.Â I was familiar with Streamlight, having used some of their early weapon and handheld lights (which I didn’t like enough to keep using) so I decided for the price, I would give the little light a shot.Â I paid just over $40.00, which seemed like a deal for a light powered by one CR123 battery boasting 180 lumens with a two hour run time on high (the 1L has three default settings; high, strobe and low, but can be programmed by you to change the order of modes or remove one).Â I figured if anything, it would be a good buy to use as a backup while on duty or lose in a couch due to its size. At the time my EDC Light was a surefire with 200 lumens of power in a two-battery body, which made it over twice the length of the 1L with only 20 more lumens of power.Â Now, brightness isn’t everything so a loss of 20 lumens went pretty much unnoticed.Â 180 lumens were more than enough for my day to day activities and as much as I loved my EDC Surefire, I loved my light taking up less space in my pockets more. The 1L carries very well, which was the first thing I loved about itâ€¦and also hated.Â Carrying something so potentially important in a small size took some getting used to. It comes with an attached, but removable, â€œunbreakableâ€ pocket clip, which due to the lightâ€™s size is pretty much required use to keep up with if you carry other objects in your pockets.Â When on the range practicing low-light, it didn’t take long before I discovered I had to be very specific about where I kept the light in order to access it quickly, though (luckily) using the 1L for the two different handheld/weapon light techniques I use was not difficult and after working with the pocket clip it didn’t take long to master.Â With an anti-roll body, a recessed tail cap button (which helps prevent accidental activation) and a slightly crenulated bezel, the 1L seemed to be designed for hard use despite its small size.Â Well, it was designed pretty damn well. Now, a small light for a reasonable price with good output means nothing if it isn’t durable and reliable.Â Is the 1L reliable?Â I’m pretty sure it was cast in the fires of freaking Mount Doom in Mordor.Â Of the instances I can remember since owning the 1L it has: fallen down a flight of concrete stairs, fallen down a flight of metal stairs, fallen from waist height to various surfaces numerous times, been submerged in water for over a minute while I blindly dug around in a creek bed for it, sat in the hot sun for hours on end on many days while teaching classes, been kidnapped by the TSA because they didn’t know what it was, taken one ride through the washer and dryer, rolled off the side of my truck (where I set it) and hit the pavement at around 25 MPH, used as a flat head screw driver (both the bezel and pocket clip), used as an ice breaker (for adult beverages), used as a glass breaker (two car windows), dropped in the snow and left over night (that was on purpose) and gone through approximately 15 batteries which would put the total run time around 37 hours. Aside from those incidents, I regularly use it for extended periods of run time while conducting searches and training low light techniques (among other things).Â Even through all of that, the Streamlight ProTac 1LÂ is just as reliable as it was on day one; the beam is still bright and crisp and the glass is mostly scratch free.Â The anodized aluminum body shows the wear of a year of use, with a few chips and dents but is no less effective for the wear. Unless I intentionally tried to break it, or dropped it into a wood chipper, I canâ€™t think of any situation I will encounter in which I will see the 1L fail.Â Though I am still a SureFire loyalist, Streamlight definitely has me as a lifelong customer for the general EDC pocket flashlight.Â If you get one, you wonâ€™t regret the purchase. Stay tuned for my second review coming a year from today. 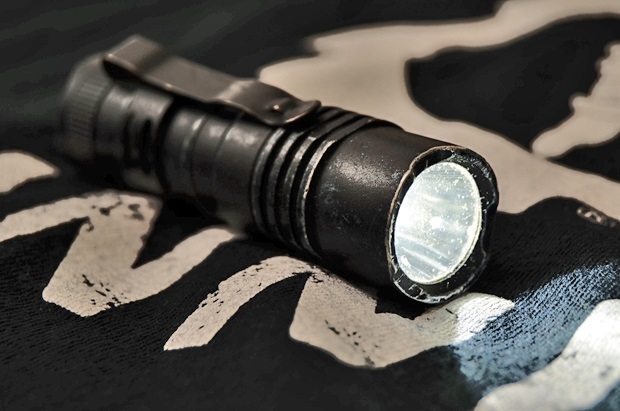 I have a few lights that i like , the Fenix rc15: the elzetta stop60 and my old back up streamlight atrophy. All tough lights that have their purpose. I’ve had one of these lights in my EDC for the past two years. The finish hasn’t held up, but it still works just as fine as the day I bought it despite regular use. Sorry… Dam smart phone .. Elzetta zfl 60. Streamlight strion. And Fenix rc15. My current EDC light that I’ve been carrying for about a year now which is said to be rated at 55 lumens on high and 6 lumens on low (seems to be much brighter than that) is an inova X1 powered by a AA battery. which appears to me to be brighter than my surefire g2 and it only runs about 25 bucks. I have several streamlight lights and I’m impressed with them. Good value for the money. You know I’ve never really considered Streamlight, always thought they were more of a low end light, but it’s hard to argue with your results. Guess I’ll have to look into one. I have one of these and I love it. It has taken falls down stairs and has been through the washer and dryer a half dozen times. It has held up through everything I have thrown at it. Great light, just hate how often I lose it do to its small size. 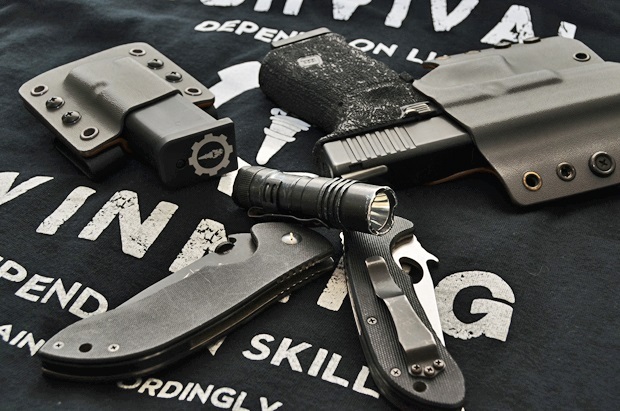 I’ve got a few Surefire Flashlights, my EDC is a The EL1 Outdoorsman. It only takes a single C123, so it’s small and lightweight. The only problem I have is losing it a few times a month because It’s slipped out of my pocket, or I’ve set it down and walked away; I have the same problem with my Pro-Tech 154-CM knife. I’ve removed the pocket clip, since it seems pretty worthless to have 1/2 the length of the light sticking out of my pocket when using the clip. I carry this light daily. It’s been dropped from incredible heights, washed in the washer at least 3 times, and it just keeps performing. It was interesting getting used to the size, because it is easy to lose. For the price, you really can’t go wrong!